If you want a healthy side dish or snack on the grill, try grilled cauliflower. It's quick and easy to make, and even people who think they don't like cauliflower are surprised to find it really tastes great with some smoke and seasonings. 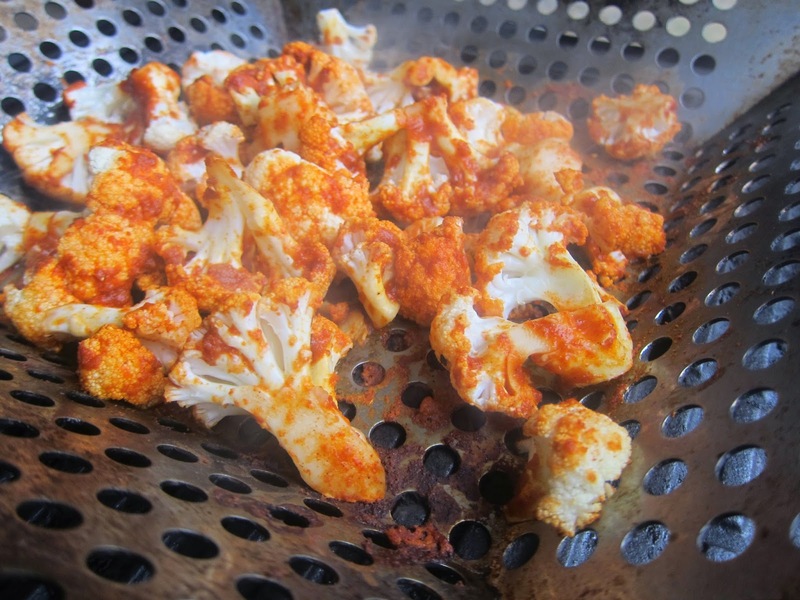 To barbecue grill cauliflower, just break it into pieces. If you use as grill wok as I do above, you can have smaller pieces. If you're turning the pieces on the grill grates, you may want larger pieces. There are tons of ways to flavor up your cauliflower on the BBQ grill. Above, I'm going with a Mexican theme to go with chicken grilled tacos. I went with SAAS seasoning. I used the hot flavor which I can tell you is very hot on cauliflower, because it gets in all the creases. More often I drizzle a little olive oil on the cauliflower and sprinkle with a favorite seasoning. This can be anything from Lawry's seasoning salt to specialty grill sprinkles. If you like the flavor, you're likely to enjoy it on cauliflower. As far as grilling, I preheated the grill to medium. The cauliflower grilled between 15 and 20 minutes for al dente. If you like softer vegetables, then just grill longer. You can test with a fork. You can feel how much give you have in the vegetables. When it feels right to you, it's ready.